There are many different styles of materials that you can use for paths. Garden paths can be made from anything from gravel to paving, pebble mosaics, brick, timber to recycled church floor flagstones! Before we get going on what type of materials you should use, we need to look at the most important part and that is getting the path in the right place. This might seem like a really odd thing to be talking about because your path goes from point A to point B, so surely it is obvious where it needs to go! 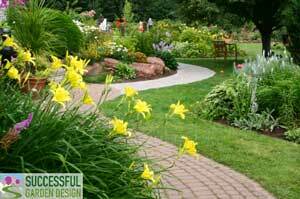 It might be obvious where you need the path, for example from your patio to your garden shed. However, just because that’s where you need it to go, it doesn’t mean to say that a straight route is the best option visually. If you can get a slightly more interesting shape into the path, or have it over to one side of the garden, rather than just having a straight line, it will make your garden much more interesting to look at. Yes, you may have to take a few extra steps each time you go to your garden shed, but that’s a small price to pay if the position of your path improves the overall look and flow of your garden. Let’s face it, you will look at it a lot more than you will walk on it! When you add anything into the garden it has to work with the whole garden, so it’s really important you take into account everything else that is there. The biggest mistake that most people make is just to add things. First, they had the shed, then goes in the path, patio etc. This makes a very disjointed and uninteresting looking garden. If you take a little bit of time to plan the shape of all of these elements together, even if you don’t put them all in at once, it will make for a much better-looking garden. A well-designed garden is like a jigsaw puzzle, everything has to fit in its place or doesn’t work. Great looking gardens are not a series of unrelated features, everything ties in together and have been thought about. So consider sweeping your path from one side of the garden to the other, or having it curve around a circular lawn to get you to the shed or the other end of the garden. 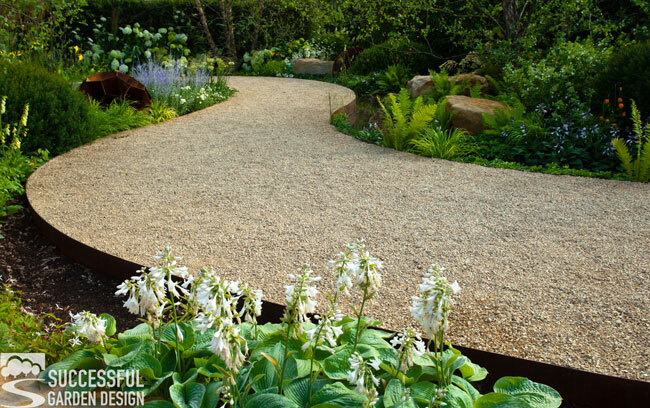 What materials should you use for your garden path? This will all come down to your tastes, style of garden and budget. Traditionally, brick paths have been very popular. If you’re going to use brick, do not use house bricks because they are not frost proof enough and will crumble over time. You need to use clay brick pavers which are specially designed to cope with the frost. Pavers are solid and do not have the indentation underneath them that house bricks do. If you’re looking for a budget path option, then gravel is going to be the cheapest option. It is not always the most comfortable material to walk on, so if you hate walking on gravel, then adding a few steppingstones through it will make it nicer to walk on. If you want a contemporary feel to your path then smooth natural paving will work well. Pebble mosaics can look fabulous, though they are very time-consuming to do, but if you’re feeling creative you can have a lot of fun with them. You can create so many different styles of path, depending on the materials you use. Anything from modern, to natural, rustic and contemporary stepping stones to solid paths and everything in between. As always, pay attention to the shape, texture and size of the materials you choose for your path. Make sure they will be practical for your needs as well as look good. A lot of times people think that they don’t need to use concrete when they build a path because it only has foot traffic on it and sand will do. Unfortunately, you can’t just put paving stones directly onto the soil or sand, because they will move and then become quite a dangerous tripping hazard. Brick paths can be laid on sand, but they will have a consolidated hard-core base underneath the sand and the edge bricks will be concreted into position to hold everything in place. 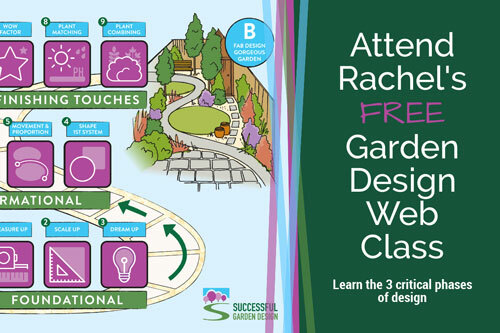 So, I encourage you to get creative with your path but do put it on paper first and check that it’s going to work with the rest of your garden.